1. Peel and finely chop onion. Peel apple and cut into 1/2 inch cubes, removing the core. Cut the butternut squash into 1-inch pieces. Strip thyme leaves and discard the stems. 2. In a large pan, heat 1 tbsp of oil over medium heat. Add onion and cook until soft - about five minutes. Mix in garlic and cook for another minute. Add the apples, squash, chicken broth, water, rosemary, sage, thyme, salt, and pepper as desired. Bring ingredients to a boil for 7-8 minutes, then reduce heat to a simmer and cook for an additional five minutes, stirring occasionally. Stir in the apple cider. 3. Transfer the soup to a blender. (This may need to be done in multiple batches.) Blend until the soup is smooth. Season with additional salt and pepper if you prefer. 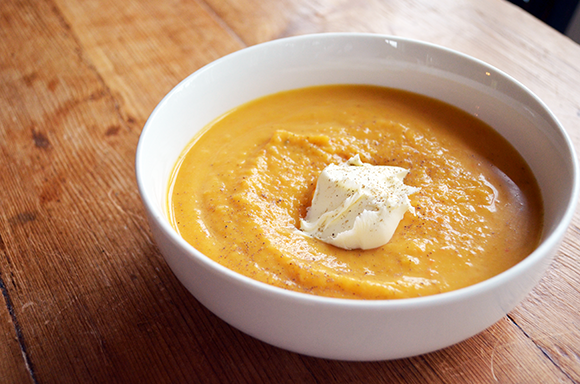 Divide the soup into bowls, top off with a bit of mascarpone and enjoy!